MSSNY eNews: Positive Budget Items! Where does the time go? After a brief holiday and New Year’s break, your MSSNY team is back at it again. Former MSSNY President Malcolm Reid, MSSNY VP of Governmental Affairs Moe Auster and I attended the State Advocacy Summit sponsored by the American Medical Association this past weekend. The meeting’s focus is on policy issues that the States are likely to encounter in the near future. State Medical Society officers meet with content experts on a wide range of topics, and officers from other State and Specialty Societies compare notes and work on solutions to improve the health of our patients and our communities. Topics included further coverage expansions for the uninsured; the ongoing opioid crisis; consolidation in the healthcare sector. Liability reform efforts centered on early communication and resolution of medical injuries outside of the traditional tort system. Two resources are PEARL Process for Early Assessment and Resolution of Loss from Stanford and MACRMI from the Massachusetts Alliance for Communication and Resolution following Medical Injury (MACRMI). Monday, I met with a friend and colleague, Dr. Tom Hughes, medical director of a large physician organization to discuss how MSSNY and the County Societies in his area could work with the physicians and other providers in his organization on physician wellness. We hope to work together to create some novel programming and resources to reduce stressors, improve patient care, and return more joy to the practice of medicine for our physicians and their healthcare teams. Our Committee on Physician Wellness has developed a number of resources that may be useful to you personally, or to a colleague who may need help. We had a general discussion about the changing nature of healthcare delivery and physician leadership needed to improve outcomes, for both patients and their caregivers. Dr. Hughes and I agreed that there is a window of opportunity for physicians to increase or re-establish leadership in patient care, physician practice, and healthcare financing. There is emerging data that the best performing systems are physician led. Unfortunately with the relative size and financial clout of other sectors, amplified by consolidation after consolidation within and across industries, the window may be closing rapidly. On Tuesday, I was honored to represent MSSNY at a City & State event recognizing the “Top Healthcare Power 50” in New York State. Opening remarks were provided by CVS’ EVP and General Counsel Tom Moriarty; Ken Raske, CEO of Greater NY New York Hospital Association. The CVS chair spoke about how CVS was going to work to transform healthcare through their pharmacies in conjunction with pharmacists and non-physician practitioners. Mr. Raske spoke about the substantial progress made in treating cancer throughout New York State, and the many advancements in care that have occurred driven by the healthcare systems of NY. Treatment innovations are still largely, but less exclusively driven by physicians. The evolution of healthcare financing and financial power within that system has moved away from physicians to health systems, Big Pharma, retailers, and the Insurance industry (JP Morgan, Berkshire Hathaway, and Amazon anyone?). That’s where we (MSSNY and you) come in. Physicians are the natural leaders of improvement in healthcare because of their duty to do their best for their patients. MSSNY provides a venue and mechanism for physicians to come together and develop solutions. Through our combined efforts we can make the world a better place for our patients, our communities, and our profession. Please send me your thoughts at comments@mssny.org. 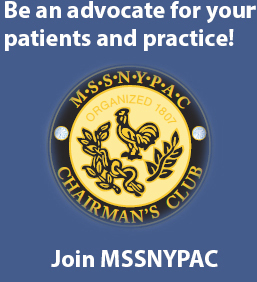 SAVE THE DATE: MSSNY’s Annual “Physician Advocacy Day” (3/6)! With nearly 40 newly elected legislators in Albany, the need for physician advocacy and grassroots involvement is greater than ever. With so much new representation, it’s vital for physicians to forge new relationships, as well as strengthen existing relationships with this new Legislature to ensure the physician community’s message is well-represented. One opportunity is to participate in MSSNY’s “Physician Advocacy Day” that will be held on Wednesday, March 6th in the Lewis Swyer Theatre in the Egg located at the Empire State Plaza, Albany NY. Click HERE to register! Proceed very cautiously on paradigm shifting proposals such as legalization of recreational marijuana and creating a single payor health insurance structure. Reduce excessive health insurer prior authorization hassles that delay patient care. Reduce the high cost of medical liability insurance through comprehensive reforms. Reject burdensome mandates that interfere with patient care delivery. Preserve opportunities for medical students and residents to become New York’s future health care leaders. Reject inappropriate scope of practice expansions of non-physician practitioners. Prevent big-box, store-owned medical clinics that will negatively impact community primary care delivery. This week, Governor Andrew Cuomo formally announced his proposed $175 Billion Budget for the FY 2019-20 Fiscal Year that would close a $3 billion Budget deficit. The Budget contains $1.3 Billion in revenue actions, including a 5 year extension of the surcharge on high earners. Increase from 18-21 the legal age to purchase tobacco and e-cigarettes; Ban flavored liquids and sales in pharmacies (See MSSNY President Dr. Tohmas Madejski’s statement of support here. Require Medicaid to cover services under the National Diabetes Prevention Programs for individuals diagnosed with prediabetes. Legalize the sale of recreational marijuana to those 21 and over (see below summary). The Governor would create an Office of Cannabis Management to oversee program. Municipalities would be able to opt out of sales in their local jurisdictions. The program is expected to generate $300 million in annual revenue. Permit PAs, NPs, social workers, acupuncturists and licensed social workers to treat injured workers under Workers Compensation. Repeal “prescriber prevails” protections for prescriptions for Medicaid FFS patients for medications that are not on the Medicaid formulary. Essential Health Benefits and easy way to appeal medications not included on insurers’ formulary. Create a Commission on Universal Access to Health Care comprised of health policy and insurance experts to devise ways to achieve universal access to high quality, affordable health care. The director will work with other agencies, including the agriculture department, to develop rules governing the safe production of marijuana plants, including devising restrictions on pesticide use. The office is also charged with developing rules to prevent people under 21 from obtaining marijuana. The recreational program will be the three-tiered grow/distribute/sell approach. This is significantly different than the existing medical marijuana program which is a “vertically integrated” system in which one company does all three things. Local Authority — The proposal permits both individual counties and cities with more than 100,000 residents to opt out – and therefore not permit cultivation or retail pot facilities in their jurisdictions – if their governing body adopts an ordinance, law or resolution to “completely prohibit the establishment or operation” of any of the -licensed entities. Tax projections– Administration projections are for $300 million a year coming from three separate taxes on the marijuana supply chain, including 22 percent of sales and excise taxes. No revenues are expected this year and $83 million next year is expected in tax receipts. Location of stores—Selling marijuana without a licenses is prohibited. Stores must be located at street level, be or a public thoroughfare, or on an arcade or “sub-surface thoroughfare leading to a railroad terminal.’’ They must be certain distances away from schools and houses of worship. Penalties—Unlawful possession of cannabis $150 fine. Possession of under 21 and less than one-half of one ounce fine is not more than $100. Fine for smoking marijuana in a public place is $150. Possession of more than one ounce of cannabis would be a $125 fine, and more than 2 ounces would result in a fine of $125 per additional ounce possessed above two ounces. Criminal sale less than one ounce would be a $250 fine or 2x the value of the sale; Criminal sale of more than one ounce would be a $500 fine or 2x the value of the sale; Criminal sale of 4 ounces would be $1,000 fine or 2x the value of the sale. Creates the NYS Cannabis Revenue Fund—monies collected for the administration of the program, data gathering, monitoring and reporting, the governor’s traffic safety committee, small business development and loans, substance abuse, harm reduction and mental health treatment and prevention, public health education and intervention, research on cannabis uses and applications, program evaluation and improvements and any other identified purpose recommended by the executive director and approved by the budget director. Advertising – The bill authorizes the office to promulgate rules prohibiting advertising that is deception; promotes overconsumption; depicts consummation by children; is designed in any way to appeal to children or minors; within 200 feet of a school, playground, child care center, public park or library; in a public transit or station; in publicly owned or operate property and makes medical claims or promotes adult-use cannabis for a medical or wellness purpose. It also allows the office to determine marking, branding, packaging, labeling, location of cannabis retailers and advertised that are aim at young people. Removes the medical marijuana program out of DOH and into the Office of Cannabis Management. Allows anyone who is authorized to prescribe controlled substances in New York to certify patients. Reduces from 3 hours to 2 hours course work requirements. Expands list of conditions to include: Alzheimer’s, muscular dystrophy, dystonia, rheumatoid arthritis, autism, and any condition authorized as part of a cannabis research license. It authorizes the executive director to add additional conditions to the list. Authorizes the executive director to set the per dose price. Allows certified patients, over 21, to cultivate up to four plants at home. Creates the Medical Cannabis Trust Fund—25% of monies shall be transferred to the counties where cannabis is manufactured; 22% shall be transferred to the counties in which cannabis was dispensed and allocated in proportion to the gross sales; 5% to OASAS; 5% to criminal justice services for a program of discretionary grants to state and local law enforcement agencies. 1800/A.1165 – Extends confidentiality protections for testimony provided by physicians at a peer review committee who may become a party to an action regarding the topics that were discussed at such peer review meeting. This would greatly improve the peer-review process by encouraging physicians to submit information without fear of misuse in subsequent legal proceedings. Assembly Health Committee Chair Richard Gottfried has re-introduced the “same-as” bill in the Assembly. 873 – Prohibits the use of extrapolation by health insurers to determine amounts overpaid apart from a few exceptions. 1796 – Clarifies liability protections for organizations that establish committees to assist physicians thought to be suffering from addiction or mental illness (like MSSNY’s Committee for Physicians Health). This is vital to ensuring that physicians can receive the help that they need to continue practice and to remain available to the patients in their communities. 1794 – Assures “prescriber prevails” protections for physicians prescribing certain medications to patients covered under Medicaid managed care. Legislation that would prohibit a mental health profession from engaging in sexual orientation changed efforts with a patient under 18 years of age, passed both houses of the NY State Legislature. A. 576/S. 1046, sponsored by Assemblymember Deborah Glick and Senator Brad Hoylman, would provide that any sexual orientation change efforts attempted on a patient under 18 years of age by a licensed mental health professional shall be considered unprofessional conduct and shall subject the provider to discipline by the provider’s licensing entity. The New York State Legislature is expected to vote on the Reproductive Health Act on January 22, 2019—the 46th Anniversary after the US Supreme Court issued Roe v. Wade. Assembly Bill 21 and Senate Bill 240, sponsored by Assemblymember Deborah Glick and Senator Liz Krueger, amends the public health law by placing the abortion procedure within New York State’s public health law. The abortion procedure is currently under the penal law. The bill is pending on the Assembly calendar and passed through the Assembly Health and Codes Committees. “The Contraceptive Equity Act” has moved through the Assembly Insurance and Codes Committee and is currently on the Assembly Calendar. It is anticipated that this measure will be voted on next week. Assembly Bill 585-A/Senate Bill 659-A, sponsored by Assembymember Kevin Cahill and Senator Julia Salazar, would require health insurance policies to include coverage of all FDA-approved contraceptive drugs, devices and productions. The bill also requires insurance coverage for emergency contraception when prescribed or when lawfully provided over the counter and allows for dispensing of up to twelve months of contraception. Be sure to register for the next Medical Matters webinar, What’s Your Diagnosis? Psychological First Aid. This program will involve more interaction from participants. You will be asked to answer questions about a case and discussion will follow. Find out if you’re fully prepared to include psychological first aid during an emergency on February 20th at 7:30am. Registration is open for this program here. Faculty will be Craig Katz, MD, co-vice chair of MSSNY’s Emergency Preparedness and Disaster/Terrorism Response Committee. Be sure to check out MSSNY’s newly updated Physician’s Electronic Emergency Preparedness Toolkit at the MSSNY CME website. This essential toolkit is set up in four modules and provides participants with a total of 15 free CME credits. Each module offers a comprehensive selection of resources on everything from legal protections and best practices to go-bag and office checklists. The Medical Society of the State of New York and the Monroe County Medical Society will host a live Veterans Matters CME seminar entitled Substance Use Disorders in Veterans on Wednesday February 6th at 7:30am at the Monroe County Medical Society, 137 Allens Creek Rd, Suite 100, Rochester, NY 14618. This week, New York State Workers’ Compensation Board Chair Clarissa M. Rodriguez announced the Board has launched a new tool that makes it even easier for injured workers, attorneys and other participants to attend workers’ compensation hearings remotely. The Board’s virtual hearings, a first-in-the-nation initiative, give injured workers a way to move the claim process forward without having to travel many miles for a hearing that may last only minutes, which is especially beneficial depending on the extent of their injuries. Parties using the app can still use other apps or features on their mobile devices while waiting for their hearing to be called. A notification will automatically alert them when it’s time to join a hearing, even if they’re in another app or their screen is off. Virtual hearings are entirely optional though, and parties can always choose to attend in-person if they prefer. After several conflict-of-interest scandals, Memorial Sloan Kettering Cancer Center in New York City will bar top executives from serving on corporate boards of drug and healthcare companies that pay them, according to The New York Times (1/11/19). Hospital officials said the executive board also finalized a series of reforms designed to limit the way its top executives and researchers could profit from their work at Memorial Sloan. The policy changes, announced by hospital executives Jan. 11, come as the nonprofit cancer center works to contain the fallout from several conflict-of-interest scandals. In September 2018, José Baselga, MD, PhD, medical oncologist, physician-in-chief and CMO of Memorial Sloan, resigned from his position after reports surfaced that he failed to disclose significant financial ties to the drug industry and other healthcare companies in more than 100 research articles. Following Dr. Baselga’s resignation, the cancer center’s partnership with Paige.AI also came under fire. The AI startup was founded by three insiders at Memorial Sloan, which subsequently granted the company an exclusive deal, presenting a possible conflict of interest. In October, as more reports surfaced about board memberships held by Memorial Sloan officials, Craig Thompson, the hospital’s CEO, resigned from Merck’s board. The drugmaker had paid him about $300,000 for his service in 2017. The policy change is just one of the steps the cancer center said it will take to overhaul its corporate relationships and conflict-of-interest policies. The hospital board on Jan. 11 also formalized a policy that prohibits board members from investing in startup companies that Memorial Sloan helped to found. In addition, it prevents hospital employees from accepting personal compensation, equity stakes or stock options from corporate boards. Despite Federal assurances that critical elements of the US healthcare system remain intact during the government shutdown, the majority of US healthcare clinicians say their patients have been negatively affected by the shutdown. Fifty-eight percent of US clinicians surveyed—including primary care physicians (PCPs), registered nurses (RNs), and physician assistants (PAs)—report that the patient population they treat has been affected by the shutdown. Physician reports of patient impact were even higher, with 74% of physicians stating that patients have been affected, compared to PAs (55%) and RNs (51%). Over a third of respondents (35%) reported that a notable portion of their patients have been affected, while 23% reported that at least a few patients have been affected. Healthcare professionals (HCPs) working in impoverished areas noted immediate impact of income loss. “Given the area I live in, many of our patients are no longer receiving checks, which means they have to choose between food or medication, which for those with families is an easy decision,” said a physician in Virginia. Few organizations have contingency plans in case the shutdown persists. Only 15% of respondents report that their organization is considering a contingency plan if the shutdown continues—such as offering continued medical care to meet patient needs even if the patient is unable to pay for them or offering payment plans. Of those 85% of respondents from organizations without contingency plans, the majority—76%—said they have not yet discussed these plans. Nine percent said that their organizations have not dealt with enough adverse outcomes yet to incentivize planning. The data are from InCrowd, pioneer of the real-time market intelligence platform for the life sciences, and were sourced Friday, January 11, 2019. The New York Times (1/15) reports that documents in a court filing by the Massachusetts Attorney General against Purdue Pharma indicate that “members of the Sackler family, which owns the company that makes OxyContin [oxycodone hydrochloride], directed years of efforts to mislead doctors and patients about the dangers of the powerful opioid” pain medication. A Lifetime Achievement Award will be presented to Ira Udell, MD at the Annual Black Tie Gala on February 9, 2019. Dr. Udell’s membership in the LIJ family began in 1974 as a rotating medical intern. After completing his ophthalmology residency at Long Island Jewish Medical Center in 1979, he served two years as a cornea fellow at Harvard Medical School’s Massachusetts Eye and Ear Infirmary. Dr. Udell returned to Long Island Jewish as a cornea specialist, joining the full-time Department of Ophthalmology faculty in 1981. In 1993, Dr. Udell was asked to serve as acting Chairman of the LIJ Department of Ophthalmology. This was the beginning of twenty-five years of service in a number of chairman roles, culminating as Chairman of the Departments of Ophthalmology at Long Island Jewish Medical Center and North Shore University Hospital until December 2017. Dr. Udell is currently the Arlene and Arthur Levine Professor and Chairman of Ophthalmology at the Zucker Hofstra-Northwell School of Medicine. He has been Chief of the Cornea Service since 1981. Dr. Udell is an Honor Award, Senior Honor Award, Distinguished Service Award, and Life Achievement Award recipient of the American Academy of Ophthalmology (AAO). He was a member of the American Academy of Ophthalmology Re-credentialing and Ophthalmic Technology Assessment Committees. 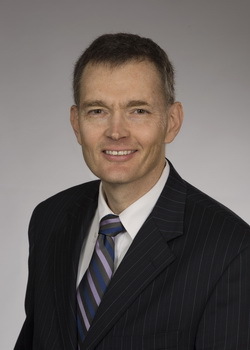 He has served in the past as New York State Counselor to the American Academy of Ophthalmology, Director at Large of the Contact Lens Association of Ophthalmology (CLAO), CLAO ERF Board of Directors, past President of the Long Island Ophthalmologic Society and President of the New York State Ophthalmologic Society. Dr. Udell has been involved in training more than 130 residents during the course of his tenure at LIJ and Northwell. His research interests, which he has extensively lectured on and published, include corneal transplantation, endothelial keratoplasty, ocular infections, allergy and ocular surface disorders. Currently Dr. Udell serves on the Steering Committee for the National Eye Institute Zoster Eye Disease Study (ZEDS). If you would like to attend, contact Jessica York to make your reservation $125 per person at 718.470.8708 or jbimby@northwell.edu. Avoid nuisance lawsuits!! Make sure your website is compliant with the Americans with Disabilities Act! We can do a free audit of your website and let you know if corrections are needed. Call 516-830-1973 or visit tinyurl.com/ADAWebsiteHelp for more information.